Betta Fish assignment - 08/07/12 . 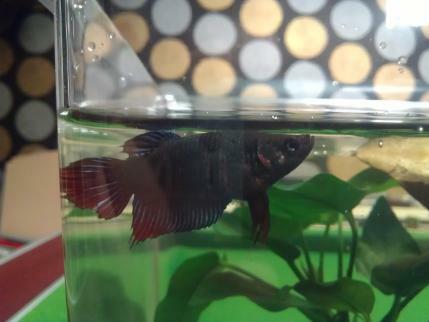 I started the research by google betta fish and also bought a book that related to Betta. 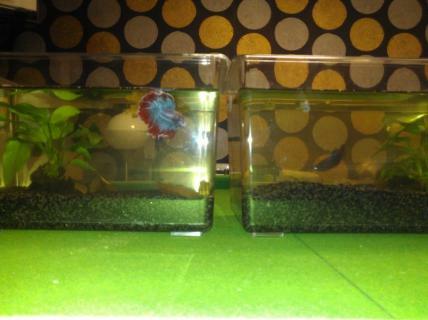 Male betta on the left and female betta on the right. 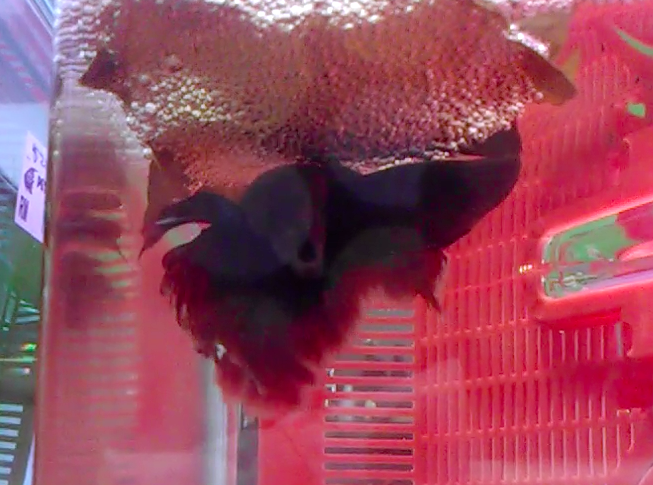 Male betta is more aggressive and always flare its gills at the female on the right tank. 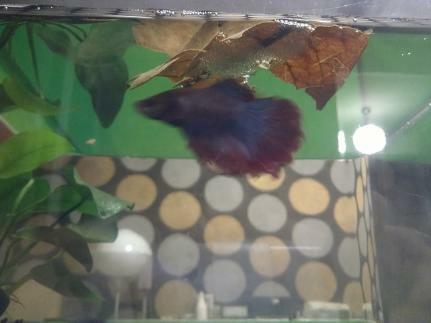 Male betta started to build bubble nest after i dump in indian almond leaves .Seems like he likes the condition and surrounding ! And it is sign of he is mature and ready to mate ! she display vertical bars on her body and will angle her head down submissively. At the same time i found out theres a small white color 'tube' come out from her stomach . It means that she is also ready to mate. i did not put them into the same tank as her stomach doesn't seems that big enough ( might not carry any eggs at the moment ). they finally have their first 'contact' .The male keep chasing the female and do not let her go near to his bubble nest . i keep feeding them every 2-3 hours until 4.40am. They have their first embrace and i video recorded it down but they did not 'success' because the male betta did not 'wrap' the female properly.Did not have chance to see the magical moment as me n phoebe rush to KC for meeting. 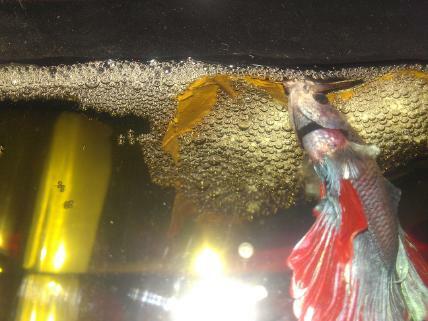 Back from meeting and found out the female betta hide at the corner and the male betta keep swim up and down beneath the bubble nest. i separate the female betta to her own tank because the male betta will attack her constantly to prevent the female betta eat the eggs. 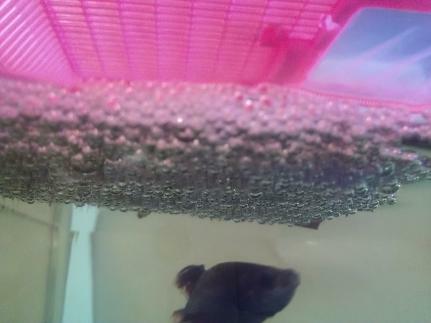 i missed out the moment whereby when they embrace , the female betta will release the eggs and the eggs will keep falling down and the male betta will go pick them up and put it to the bubble nest. 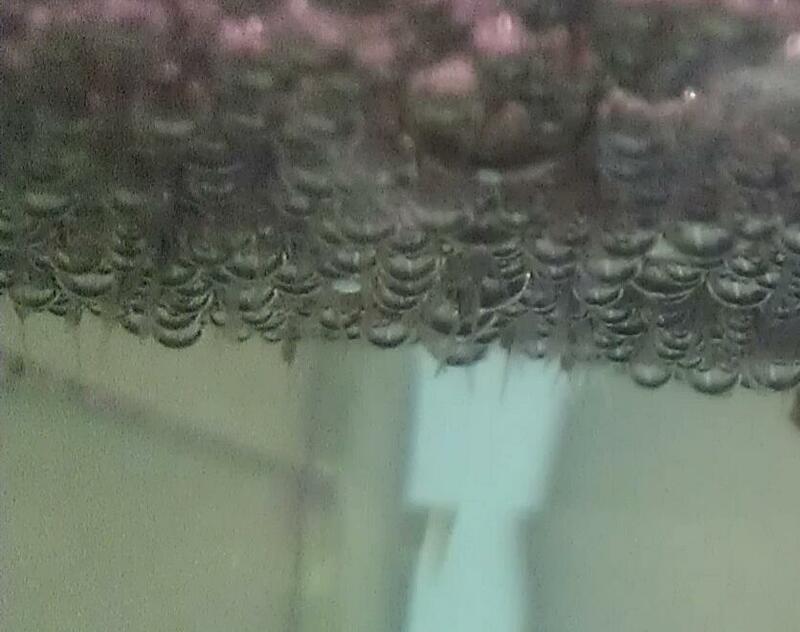 i studied that in this period (about 48 hours) the papa will not rest and guard under the bubble nest and pick up those eggs that drop down from the bubble. Again,out for meeting. i will offer the young bettas to KB , Ram and rajandra 1-2 weeks later and also teach them how to take care of these young fighters ! Thanks to TR for this assignment, i see how the male father 'busy' all day long to guard and protect the eggs like he never need to sleep. How beautiful is that ! And now i see those cute babies as my grandchildren ~ phoebe said i'm crazy because i look at the male n female betta mate for more than 8 hours until i forget to sleep , LOL ! i guess breeding the fish can also develop care n kindness ............. i will place a buddha image infront of them and let them bless by Buddha !